This die set has so much possibility. If you are like me and dread making those masculine cards, this set can easily become your all-in-one go to product. And the price point is perfect! I embossed the hat and mustache with multi-colored ultra thick embossing powder. I used our Nesting Stitched Circles to cut out the elements from my designer paper, tucking in the wood gears here and there. I accidentally got glue everywhere, so I added mica flakes to cover that up. I really like the mixed media effect it added. I created this free digital stamp file for your downloading pleasure. Simply right click on the image to "Open in a New Tab" then right click and "Save Image As." I dipped my print into a mix of Distress Inks to help coordinate with my vintage papers. I truly hope this helps get you started on cards for the men in your life. I appreciate your visit and support! 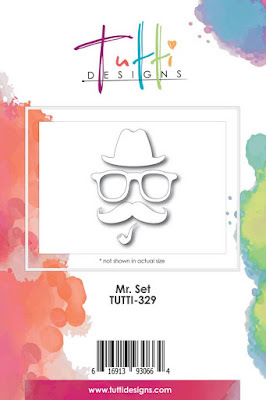 Purchase your Mr. Set die collection HERE today! Fantastic creation! Love that die set and all of the elements and accents you used on your card! Masculine cards are a struggle for me, but you have made a masterpiece! WOW ... this is totally A-M-A-Z-I-N-G! I just LOVE it Autumn! So creative and a style I struggle with ... thanks for inspiration! Awesome 'share' also ... thanks so muc! Great masculine card, Autumn, and love the steampunk design! That's a great die set, too. Thank you for the free digi! !